Have you taken a look at the new, additional training in your ProAdvisor® tab lately? There is a much-awaited category called “Specialty Courses” appearing right under the QuickBooks® Online courses. 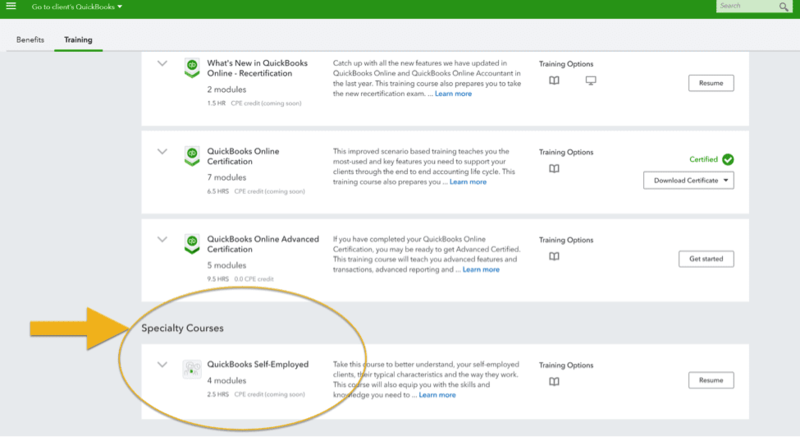 In this section, you will find the new QuickBooks Self-Employed specialty training. This is very exciting news, so let’s explore WHY! Some of you may already know that the fast-growing gig economy that is creating millions of new on-demand workers every day is also creating a critical demand for financial assistance with a human connection. In a forecast by Intuit® and Emergent Research, the number of Americans in on-demand jobs will grow from 3.9 million to an impressive 9.2 million by 2021! Many joining the self-employed economy are coming from a wage earner lifestyle or have started a side hustle through passion or necessity. What this means in plain words is that these self-employed workers have become business owners overnight! They need help tracking their business transactions, understanding their possible tax benefits and deductions, and staying compliant with their self-employment taxes. These are all new areas of learning and exploration for the self-employed worker. This is an incredible business opportunity for the financial professional, as well as bookkeeping, accounting and tax professionals who are ready to serve this massive market. We are transforming ourselves into #IntuitFirmoftheFuture Advisors, which means we need to be well educated not only in the best technology for clients, but also the implementation and workflows associated with these applications. In the past year or so, Intuit has made a significant leap forward with its educational content by providing real-life, interactive training that many of us in the QuickBooks ProAdvisor community have been actively requesting. Those of us who have begun working with self-employed and small business clients want relatable case study examples that we can learn from and then apply right away with our clients. We also value the importance of setting up our clients for success which entails knowing which solutions best fit this growing market. The QuickBooks Self-Employed specialty training is a 4-part module course positioned to help financial professionals target and support clients that are Schedule C, self-employed SOLO business owners. The primary objective for taking this course is to better understand and relate to these specific self-employed clients, their unique characteristics and the economy they work in. This course will also equip the financial professional with the skills and knowledge required to setup, support and advise their self-employed clients in using the QuickBooks Self-Employed product efficiently and effectively. The new format of this training is exciting and worth exploring a bit further. The first module is focused solely on connecting the dots between the self-employed market and their unique needs as micro-business owners. Setting up a new QuickBooks Self-Employed client from scratch. Catching up on previous period accounting for a client that needs to prepare for tax time. Creating automations and smart rules around bank transactions to save time. Sharing the mobile features of QuickBooks Self-Employed for those clients on the go. Adding value as a financial professional by proactively reviewing clients’ business transactions in real-time and building best practices around quarterly tax obligations. 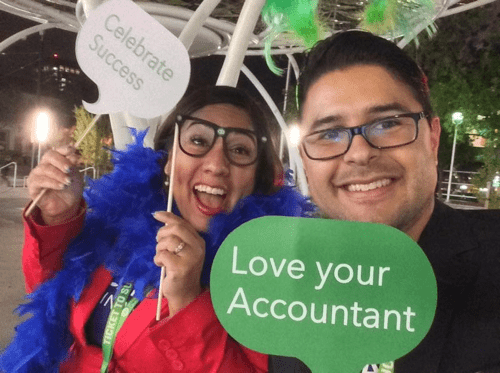 QuickBooks Accountant University has created a 2-hour webinar that takes you through this QuickBooks Self-Employed specialty training in a live training format. Attendees are able to join their peers in this monthly webinar taught by a practicing accounting professional who works with self-employed clients. Taking the webinar or the 4-part module course is a sure path to setting your firm and your Schedule C, self-employed clients for financial success! Post courtesy of Intuit Firm of the Future. Ready to purchase QuickBooks Online at a GREAT discount? Click the following link to and receive your 50% off MSRP price for the first year! 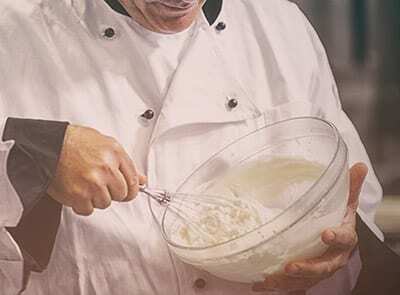 Are you a 1099 Contractor/Schedule C taxpayer & have you confirmed that QuickBooks Self-Employed is the BEST fit for your self-employed business? BUY NOW and SAVE 50% for 12 months. Check our QuickBooks Comparison chart.